From the internationally admired, award-winning creator of many celebrated picture books, including On a Magical Do-Nothing Day, A Lion in Paris, and The Wonderful Fluffy Little Squishy, comes a story about lonely Harold Snipperpot, a seven-year-old boy who has never had a real birthday party, until now. Harold is turning seven years old. He’s never had a real birthday party. That’s because his parents are too grumpy. But this year they feel bad for Harold. “We’ll call up Mr. Ponzio,” says Harold’s mother. So they do, and Mr. Ponzio agrees to help, “The party will be absolutely extraordinary, Mrs. Snipperpot.” When everyone arrives at the Snipperpots', everyone—especially Harold—is absolutely flabbergasted. It truly is a party like no other. 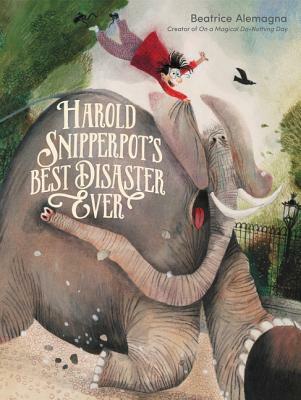 Full of surprises, every animal imaginable, and magical moments galore, Harold Snipperpot’s Best Disaster Ever is a party unlike any other. Perfect for fans of other shocking shindigs such as Secret Pizza Party by Adam Rubin and May I Bring a Friend? by Beatrice Schenk de Regniers.